Assessing Russell 2000 overvaluation by discount of dividends. For all of these reasons, we have decided to only discount the dividends for 2018, not only for Russell 2000, but for all the indexes that are under the valuation scope of our trading algorithm. 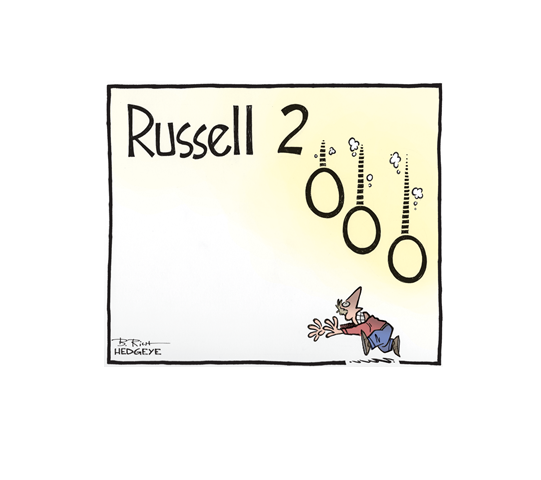 But as we will see after, Russell 2000 overvaluation would be also the conclusion considering a longer term for estimations. 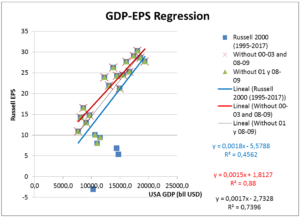 The correlation between Russell’s EPS and the USA’s GDP is also good if the recessional years are excluded. The reason for this elimination is that during the low periods, a significant number of companies incurred extraordinary losses and impairments that are not only a consequence of the state of the economy of the current year, but also the failure of longer term investments. 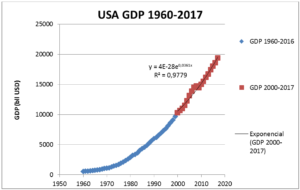 During these periods, the correlation of the two magnitudes breaks down, and it reverts to high levels when the economy returns to a long term growth tendency. But as Chart 2 shows, the main difference between including recessional years or excluding them is not in the base estimation of the diverse models, which are very similar. 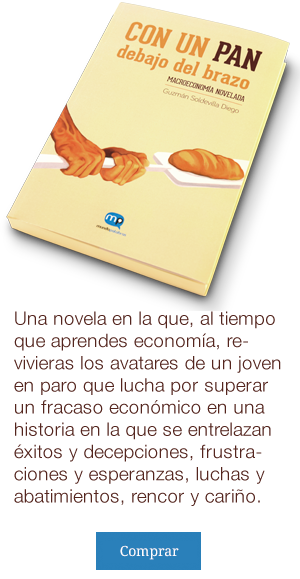 The variation is more in the standard deviation, and therefore the precision of the predictions. Option B: 1995 -2017 excluding 2001, 2008 and 2009. Option C: excluding the period between 2000-2003 and 2008-2009. Although we will analyze in further publications the rest of TPrice formula factors (Pay Out, g and Ke) the Russell 2000 overvaluation seems to be clear according to a PE of 49x considerirng option B based in Bloomberg´s time series trailing twelve month earnings.